In poking around on some of my Windows 10 systems, I occasionally encounter the $SysReset folder on the OS drive. The dollar sign at the start identifies it as a hidden system folder. 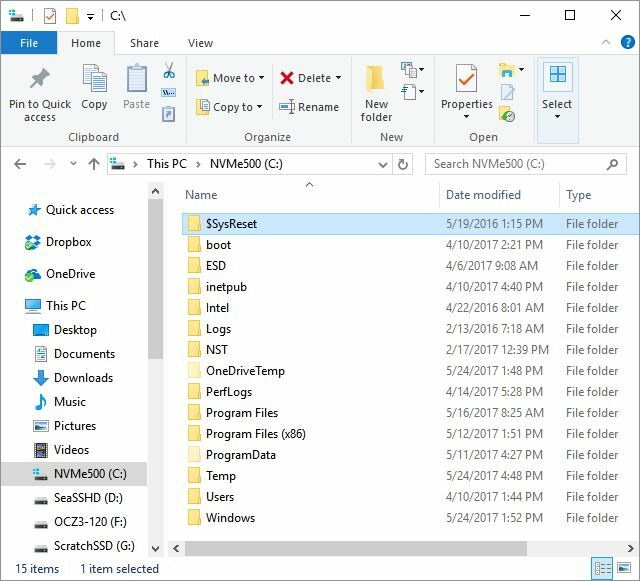 Thus, astute readers already know I routinely check the radio button in File Explorer Options that reads “Show hidden files, folders, or drives.” Unlike many other hidden folders, $SysReset is easy to delete. Even better, it’s usually free from ensuing complications when deleted. Hence, the title of this blog post. Here, I explain how to bid $SysReset goodbye in Windows 10. Because $ is ahead of the alphabetic characters in the collating sequence, hidden folders show up at the top of the File Explorer list. Make It Happen: Bid $SysReset Goodbye! Before we chase the $SysReset folder into oblivion, a bit of explanation may be helpful. This folder bears often bears testimony to a failed reset or refresh operation in Windows versions from 8.0 forward. Inside this folder, one finds a Logs folder with traces of prior activity. In my case, this was a file named SetupAct_offline.log. That file provided information about the presence or absence of a factory reset image on my PC. I can tell from the date it ran that it coincided with using the Macrium boot repair tool on this PC. I ran that tool deliberately, in connection with a story on boot repair tools I was writing for CIO.com. The log simply reports that my boot/sys drive includes no factory reset partition (no surprise, because I clean-installed the OS to it myself in April). Thus, it’s no problem for me to remove the folder and its contents from the drive. Accordingly, I right-click the $SysReset folder entry in the right-hand pane. I select “Delete” from the pop-up menu, and BAM! it’s gone. Just that easy, for once in the sometimes-frustrating contortions necessary to achieve Windows cleanup. No turning to tools like Unlocker, nor any need to boot to a rescue or repair disk to root out files the OS doesn’t want to relinquish. An occasional triumph over Windows is worth savoring, so I hope you’ll savor it with me. God I love! I've been fighting this for almost 2 mnths with my first pc build and think you may have literally saved my life!